The most precise mechanical timekeeping of that era was coming from big pendulum clocks - and it is no accident that Harrison had major achievements in that area, including forms of temperature-compensated combinations of brass and steel which together with the use of rolling contacts (which don't require the level of lubrication needed by sliding contacts) enabled him to claim for some of his pendulum clocks an unheard level of accuracy for that time - better than 1 second/month or 12 seconds/year !!! And to cut the story short (you can take a look for details at http://www.nmm.ac.uk/harrison and also the PDF from there for even more information) after a huge amount of work extending over many years the fourth major Harrison timekeeper - today called H4 - was completed in 1759 and then later "Harrison's son William set sail for the West Indies, with H4, aboard the ship Deptford on 18 November 1761. 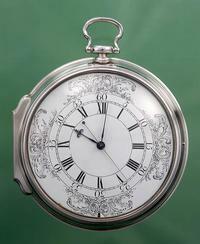 They arrived in Jamaica on 19 January 1762, where the watch was found to be only 5.1 seconds slow!" - which gives us around 30 seconds/year around the middle of the 18th century !!! Harrison had a lot of problems getting recognition for his achievements and the story is a lot more complex than that, but the final part of the challenge was the ability to repeat such astounding results - which was proven possible with the first 'official replica' of the H4 made in 1769 by Larcum Kendall - the watch known today as K1 (and which itself has seen amazing travels with captain Cook around the world). So what has that to do with today watches ? Not much - except that even some of the very expensive quartz watches of the 21st century are today only guaranteed to about 15 seconds/month and the mechanical 'chronometers' (some of them prefixed with 'superlative' but purely out of marketing reasons and without even the slightliest amount of technical value) are only guaranteed to about 5 seconds/day - the same five seconds that H4 achieved over 2 months in 1761-1762. So is it possible that no progress was made over more than 250 years ? Of course not - but the marketing machine was so incredibly effective in pushing all that progress aside and replacing it with claims that require no proof (or technical excellence for that matter) that very likely most people know way too little of the real precision champions of today - not even about the more affordable of them - and this small review is precisely about two of those. And again is no accident that the only well-under-1000-US$ wristwatches that are GUARANTEED a better precision than the H4 are relatively high-end Japan-only models - apparently a country where enough people still value engineering and measurable technical results more than marketing and hype (but even that might be changing). The specific two models under real-world test in this comparative mini-review are the Citizen Exceed EBJ74-1742 and the Seiko Spirit SBQJ015 - but more generally that will be about the Citizen caliber E510 and Seiko 8F calibers. I have personally first bought the Exceed and only a month after that the Seiko, but from an historic point of view it seems that Seiko 8F calibers were first (around 1998) and Seiko sold them worldwide (even if certain case models were Japan-only) and only at some point later the Citizen E510 caliber was launched - which however seems to be (just like Citizen A660) a Japan-only caliber that seems to have never been sold in models outside of Japan and as a result much less is known about them. Today there are plenty of quartz perpetual calendars around - the digital-display version was the first introduced since around the 70s (most probably starting with the Synchronar 2100) and it seems that the all-analog versions are starting from 1989 with the caliber 6700 Citizen Avalon 'Supercalendar', then in 1991 the Seiko caliber 6M13 which is also a millennium-calendar complication knowing about years 2100 and 2400, and also the swiss ETA 252.411 developed in 1991 and released in 1992 (for instance by Longines as caliber L234) - however the main reason why I have picked Citizen E510 and Seiko 8F56 was in fact related to Harrison's main obsession - the ACCURACY of timekeeping - and the modern history around that starts slightly earlier - at the end of the 1960s with the titanic competition for the first quartz wristwatch involving Seiko and a group of swiss companies grouped around CEH (Centre Electronique Horloger) - with the result of launching about 100 pieces of the Seiko Astron SQ on sale on Christmas Day 1969 (for a price at that time around 450000 yen when Toyota Corolla E10 was around 430000 yen) and then later in 1970 launching a number of swiss models based on the Beta21 caliber. But while quartz watches have immediately surpassed by an order of magnitude (10 times) the precision of even the most accurate (and expensive) mechanical wristwatches (and at least about 2x the precision of the tuning-fork accutrons) initially the precision was still in the range of under one second/day yet closer to 15 seconds/month - that is pretty much the current accuracy of the 'ordinary' quartz models - which in itself is not so accidental since the value is actually a close equivalent of the "5 parts-per-million" (5ppm) industry-standards precision. And while that immediately meant a huge step forward it was still around 3 minutes/year - which was not such an impressive result compared to a 12 seconds/year for a pendulum clock or the equivalent of 30 seconds/year for the first voyage of the H4. But the precision-race was only starting and for a few years it was a very interesting race - even if it was a really high-end race, with models still closer to the price of a car. There have been a number of very smart ways ( see this fascinating thread in the WUS HEQ forum ) to get around the technological limits of quartz in general and that era in particular ( you can read another VERY good article here or here ) and in some way the best part of the race took part starting with the middle of the 1970s when Omega had their Megaquartz 2400 (with the 1974 2.4 MHz marine chronometer caliber 1511 having +/- 12 seconds/year) and then next year the late-comer Citizen had the Crystron Mega (4 MHz , +/- 3 seconds/year - tightest specification ever for a wristwatch - only 3000 made in total at around 4 500 000 yen each - already well in the range of a luxury car). The increased frequency (from around 8 kHz to 32 kHz - which still is the standard today - to MHz range) was a serious advantage (in the same way a tuning-fork at 300 Hz was better than the 5 Hz hi-beat which was better than the lo-beat 2-3 Hz) but the power consumption was a lot bigger and most important - it was very difficult and very expensive to build and calibrate those far more complex forms of quartz cuts (compared to the standard 32 kHz tuning-fork cut), and as a result probably fewer than maybe 10000-20000 of those MHz range calibers were EVER made - and that also explains why Seiko instead focused during the 70s on the lower-cost middle-frequency road which provided the very first relatively AFFORDABLE accurate models with the "Twin Quartz" models (from around 1978 to the start of the 1980s) - where two different quartz crystals - one at 32 kHz and one at a higher point, often 196 kHz, but both with a similar thermal coefficient - are used to compensate for the differences induced by temperature changes - with an accuracy result around 20 seconds/year down to even 5 seconds/year - now finally in more affordable wristwatch models. 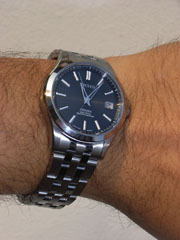 However those Twin Quartz models were still clearly more expensive than ordinary single-quartz models, and it seems that during the 1980s the economic pressure pushed many of the normal consumers away from the more precise models, with the result that in time Seiko has mostly abandoned that approach - with only one or two exceptions - which FINALLY brings us back to calibers 8F (launched around 1998)- those are higher-end models designed with a perpetual calendar and a single 'temperature-insensitivized' 196 kHz quartz crystal - probably the last to be still produced of the quartz calibers with a frequency higher than 32 kHz (also used in the ladies-models with caliber 4F perpetual, and in two non-perpetual calibers used in certain discontinued Pulsar models). In the 8F family there were 8F32 (date), 8F33 (day/date), 8F35 (date, high-torque) and 8F56 (date, GMT) - all used a HUGE battery (CR2412) with the result of claiming a very convenient 10 years battery life (8 years for 8F35 which is found in some heavy-duty diver models). So that (historically) brings us to the first of the two watches that are the subject of this comparative mini-review - Seiko Spirit SBQJ015 (with caliber 8F56) is a Japan-only GMT model made from high-grade titanium with a surface coating which is called by Seiko with the name of Diashield - and in the other "corner" of this mini-review is the Citizen Exceed EBJ74-1742, again a Japan-only classic model made from high-end titanium with a specific surface finish that is called by Citizen with the name Duratect - however less is known about the history behind the perpetual calendar caliber E510 used in this model (and launched around 1999-2000) - my own speculation is that caliber E510 (together with E410 used in ladies-models) was mostly a sort of a hybrid between solar-powered perpetual calibers and the thermo-compensated perpetual caliber A660 (which I believe was initially launched around 1995 and is still being made today) - however some real-world tests ( see this thread ) have suggested that the thermo-compensation table in E510 is slightly more modern while the internal design was also quite different having a new approach with no jewels but instead with some very interesting stepper choices - probably the design was just a test in case the customers would want a new war for the lower-cost high-accuracy models but that was not the case and caliber E510 has only found a (temporary) place in the middle-to-high-end range at Citizen in the Attesa and Exceed lines, established itself as the most accurate solar perpetual calendar wristwatch of all times and then eventually was eliminated from production (I believe around 2004) since it was most probably cutting into the profits from the highest-end Chronomaster (The Citizen) line. And now to the "side-by-side" competition, Seiko Spirit (which I also nick-named 'Travelzilla' for reasons that will become soon clear) vs. Citizen Exceed (for which I don't have a final nickname but 'Shinyella' might not be totally wrong). 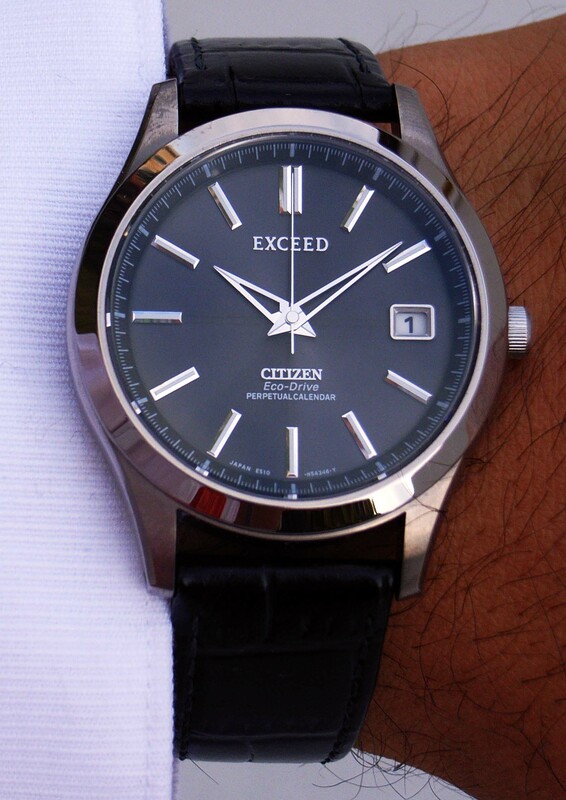 Both watches are about in the same price range - around 450$ for the Seiko and a little more (around 550$ currently, but increasing) for the Citizen which is discontinued and harder and harder to find (main sources on eBay, EBJ74-1741 while-dial and EBJ74-1742 black-dial, and I could not find any decent Attesa model). 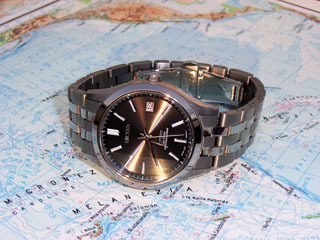 Seiko SBQJ015 is still in current production in Japan (but maybe not for a very long time), and alternatives with dial colors other than black are available. Japan-only models can be ordered from some of the well-regarded sellers from there (Higuchi, Seiya, Ujiie). 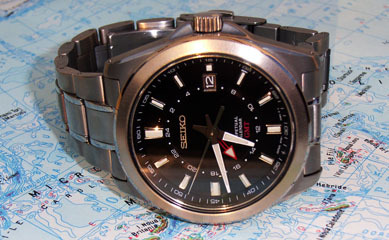 Another note for prospective buyers is that from Seiko slightly cheaper 8F steel models are still available, also a nice scuba WR200 diver and from time to time under-100$ NOS lower-end models can be found on eBay - so both the price and the availability advantage goes with Seiko. When you first see them in reality, both watches look very impressive, very high-end and somehow tool-oriented (mostly since both have black dial and a similar very simple/clear dial). Size is the first point where we see a big difference - the Citizen is slightly more elegant and the design is a classic one - it would have been a medium-large classic design a few decades ago but right now most people (including a number of ladies) would consider it a rather small watch with 36 mm transversal diameter without crown; in my case I am perfectly happy on my wrist with the Orange Monster (OM) or the Yellow Kinetzilla (YK) but I find the Exceed as having the PERFECT size with around 30 mm of dial - however you have been warned, it is definitely a matter of taste! Both watches are VERY comfortable to wear even in bad or humid weather (as most titanium watches are) - maybe with a small advantage to the smaller Citizen. Both watches have drilled lugs (not uncommon in tool watches at that price point) and also look very well with a black leather strap - but while the Exceed has 18 mm lugs, the Spirit has huge 22 mm lugs. Both watches also have sapphire crystals - flat and uncoated (but looking huge) for the SBQJ015, ever-so-slightly domed and with anti-reflective coating on the inside on the EBJ74-1742 - both will probably have a scratch-free very long life. The main improvement that I can see in this area would be for the Exceed to not have the highly-polished rows in the bracelet - that is strictly for looks but people that are into "looks only" might buy other watches anyway. Also it would have been a lot nicer if the Seiko Spirit would have been WR200 with a screw-down crown - the crown is anyway totally unused in the base position so why not make it an even tougher tool watch? Both designs go for the simple, utilitarian, 'black with only applied markers for hours' look (plus painted seconds) - the actual results are however different, special and unique - for the Exceed the major element is the presence of the solar cells into the structure of the dial itself with circular grooves so fine that can not be seen with the naked eye, but which have a specific radial reflection with a very 'shiny' overall result (including very shiny hour markers and hands) - so much so that the presence of anti-reflective coating is totally lost to the casual observer and overall 'Shinyella' might be an appropriate nickname. The legibility is however good in strong light to perfectly acceptable in low light, however since there is no luminous paint of any kind the watch can not be seen in total darkness. For the Travelzilla the size is the defining element - and as a result the visibility is perfect, and the amount of lume, while not on the Orange Monster level, is however perfectly usable even in total darkness. There is a small amount of luminous material even on the short red GMT hand, but there is none on the seconds-hand, which however has a very interesting finish with a variable look in direct light from a shiny mirror to dark gray depending on the view angle. Neither dial is very busy (the Spirit has the extra GMT markers but the size of that dial is so big that it never becomes too crowded), and on both you have some nice and shiny applied names (Exceed on top + Citizen on the bottom on one, Seiko on the top for the other) and also extra painted info (EcoDrive Perpetual Calendar on one, Perpetual Calendar GMT on the other) that could have been as well missing but probably added nevertheless for the more uniform look in the center of those dials. The possible improvements in this area might be to make the GMT the longest hand on the Seiko (or at least make it slightly less likely to be lost under all the other hands), and to add lume on the hands and dial on the Citizen (and maybe make it slightly less shiny) - none is however a deal-breaker in the specific design of each watch. Well, there was a lot of talk about looks but now it's the right time to see how those two beauties actually work - and it has to be said from the start that both live up to their (high) expectations! 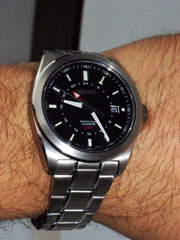 The Seiko is clearly the older and far more traditional design - a totally classic 'quartz with analog hands' design with a single one-way stepper driving all four hands and also the crown traditionally linked to the hands in the second position - with the only innovation of a bidirectional ultrasonic motor for the date dial (in 1998 it was the first of it's kind in a wristwatch when introduced in calibers 8F). Even the GMT hand is of a rather classic type - but the way in which it works is named by many people as 'true GMT' and is generally regarded as the best approach possible in an analog design - on the first position of the crown the entire mechanism continues to work and just the normal 12-hours hand jumps forward or backward (in the old watchmaker tradition = mechanically and not electric-driven) in precisely one hour steps without disturbing the GMT hand, the minutes hand or the seconds hand - with the result of a very easy adjustment for traveling over full time zones or during Daylight Savings Time without losing any of the precision of the watch. The date change is linked to this hand (and not the GMT hand) so when you step over the 24 hour limit the date goes into the right direction. There are a number of ways in which you can use the GMT hand - one very simple approach if you travel A LOT is to set it to your local time and have the same hour shown by both the GMT and normal hours hand when you are home, and when you cross time-zones you just pull the crown out at the first stop and adjust the 12-hours hand while leaving the GMT hand for the 'away' zone. That is however a little strange on Daylight Saving Time - when you have to adjust both hands. The second alternative (which I am using) is to have the GMT hand set to UTC/Zulu (which does not follow Daylight Saving Time so you do not have to alter it often) and the normal 12-hours hand set to the local zone where you live/travel - and use the GMT hand to calculate times in other places of the Earth. There is also the alternative when you do not travel almost at all but you have a lot of contacts in just one specific time-zone to set the GMT hand to that zone - again with maybe separate adjustments on DST change day(s). The more advanced parts of the calendar can be read with a simple trick - you pull the crown to the first position and then you quickly push it back (within a second) - after that the seconds hand will give you an indication of how many years have passed since the last leap year, then the wheel date will display for 5 seconds the current month (and then return to the normal date). Everything works reliably and I guess that the design is well tested and has proven itself in time (maybe with the exception of the ultrasonic miniature motor for which the experience goes back for 'only' those about 15 years of the caliber 8F history). The final minor downside (and this one certainly is related to the age of the design, coming from times when integrated circuits were really expensive to design and make) is the lack of a simple user-mode way of setting the perpetual calendar - when the battery is changed you must either start with some battery left and have a very quick and effective change (apparently less than 1 minute) or you must re-program the perpetual calendar with electrical pulses directly to the mechanism - of course this will only be a potential problem every 10 years, and with about two weeks of battery-end-of-line indication (2 second stepping) it might never become a real problem to any normal user. Moving now to the Exceed we probably meet one of the most advanced design styles of the all-analog quartz mechanisms (at least for its time) - a "fly by wire" design in which the crown is not directly linked mechanically to the hands but instead it drives a sensor (which clicks for user feedback) which in turn sends impulses to the internal circuit which then drives two full two-way steppers plus one single-way stepper (pretty much the same tried and tested design as in the caliber A660). The hands even have a way to be user-recalibrated (with the all-reset procedure) and one extra recessed pusher allows for more commands - of which the simplest is the 1-hour correction (again, VERY handy on time zone change or DST change). The date advances precisely at 00:00 (and it only takes like 1-2 seconds for each advance), and it will correctly advance or go back even during time zone changes. The calendar can be checked by pulling the crown to the first position - there is a slightly more complex way in which the seconds hand shows both the month and the leap-year position (basically each hour marker is the corresponding month, and each second extra from that is one year more from a leap year), but the advantages are that it will be much faster, will be visible for as long as the user wants to, will take less power and can be directly set by the user. A very smart design also makes E510 the analog design with the longest battery life between recharges - the seconds hand (but only that, everything else works normal) will stop ticking in darkness (when you can not see it anyway) and only that reduction apparently can cut the power to a level where it can last about 4 years with a full battery charge! The really fun part of this however is when you bring the caliber E510 back to light (for instance in a gray day when the watch was hidden under your sleeve and then you want to check the hour or when you turn on the lights in a very dark room) - at that point the seconds-hand will restart and quickly-quickly go to the actual seconds value! And of course being a solar watch you never have to worry about battery changes or wearing the watch each day to keep it working - you just need to leave it somewhere in light (but not direct sunlight which might heat the watch too much). The rechargeable Panasonic MT920 also seems to be very well regarded and it will probably last a long time, and it is anyway available at a decent price (since pretty much over 90% of the rechargeable batteries used by watches today are either MT920 or CTL1616). There is however a HUGE advantage with the caliber E510, which was reported by most users and which is really important for me - the hands look PERFECTLY aligned ALL the time - that was achieved on the minutes + hour hands by having those move with 4 steps / minute - which results in hardly visible steps where any gravitational backlash is practically invisible to the naked eye; the really interesting part was with the seconds hand - on that I can only assume there is a special design on the stepper motor so that there might be some extra permanent magnets or something that totally eliminates any backlash or automatically recalibrates the seconds-hand on each full cycle - no mater how it's done it is the best seconds hand alignment that I have ever seen and it seems that all E510 watches have that!!! And a short introductory note on the completely different ways in which those two designs achieve their high-end accuracy (references for extra info are a few paragraphs below) - the 8F caliber is very old-style and is mostly analogic in this respect too - the accuracy is simply based on having a quartz crystal which does not have the normal steep dependency of frequency to temperature (present in the normal 32 kHz tuning-fork-cut quartz crystals) but instead something much flatter - however that dependency can be very tricky from one batch of crystals to another and the influence of temperature is still a little present at this medium frequency; even the post-factory calibration is done in a rather unusual way that involves a one-way operation of cutting a 'pattern' from the back of the mechanism. On the other hand caliber E510 has a totally different approach - the quartz is (probably) not very special but instead there is a small digital table with numeric values that are used by a FAR more complex digital circuit to compensate for the different speeds at different temperatures by substracting or inhibiting a number of oscillations - that 'inhibition' only takes place over a slightly larger interval, with the bigger intervals (up to about 512 seconds or about 8 minutes) and the finest temperature intervals (largest compensation tables) having potentially the best accuracy (but maybe with some drawbacks when the watch is subjected to fast variations in temperature). Both quartz crystals might be also 'pre-aged' - since all industrial quartz crystals are subject after production to a very small frequency change with time (which might be improperly named aging), but which also is almost invisible after the first 6 months of use. Finally a few words on timekeeping accuracy - the feature that really differentiates those two calibers from 99.99% of the other analog quartz calibers - correctly estimating at user-level the precision of such high-end quartz is better done after 12 months of average use (and after eliminating any 'leap seconds') so in this case is only the start of this estimate - I only had the E510 for about 3 months at the time of writing this mini review, and I have lost almost the entire first month as a result of pulling the crown by accident to the second stop instead of just the first, but during the last two months 'Shinyella' only gained about one second (and it was barely getting wrist time during those last months) - that points to a very decent +6 seconds/year - which remains to be proven after another 10 months, but it looks like it is well within the Citizen specification of less than 10 seconds/year! For calibers 8F the original Seiko accuracy specification calls for a level of wrist time that somehow assumes that this is your only watch and as a result there are a number of owners that have reported less than stellar results, with some even slightly out of the normal range of 20 seconds/year so I din not have huge hopes for this one - however after the first almost-full month I had the pleasant surprise of only seeing an error of less than minus 1 second - but that was with a LOT of actual wrist time, we'll have to see how the next months will go with other watches probably getting their own fair-time on my wrist - but it seems that lately the 8F56 models have become much better calibrated for the average watch aficionado. There are very few alternatives at this price point with ALL the features of the two models described (especially titanium + precision). If you can spend at least 5 times more money on a single watch you should be looking into the Citizen Chronomaster (caliber A660, there is also a discontinued Campanola with that caliber) and eventually Grand Seiko (which does not have a perpetual calendar; older models had caliber 8J which has the very handy 1-hour correction but the latest and highest-end caliber 9F do not seem to have that). If you are an accuracy freak but you don't really care where that accuracy is coming from and you live in an area covered by the atomic-radio signal you might also be OK with a cheaper radio-controlled watch (but you should be aware that there are many limits with that). There is another good review for just the Seiko located here (and it has many good pictures). A video segment from the same author can be found on YouTube where you can see the calendar and the hour jumping. Also pictures of the internal movements for both calibers and many, many other can be found in this thread. Other internal pictures for an 8F caliber and battery-replacing info can be found here. Finally some of my own quick initial pictures (later I might add more) - click on an image for a larger view!